Uncovering Food: Uncovering Food runs for Food! Uncovering Food runs for Food! 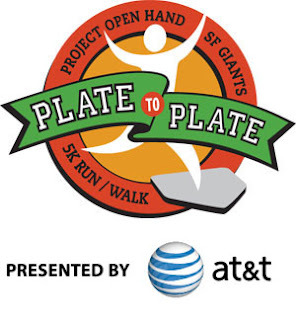 On August 30, 2009, I will join fellow runners in the San Francisco Bay Area to run the Plate to Plate 5k. This run will benefit Project Open Hand, an organization that delivers food to the ill and elderly in the community. Project Open Hand has also served as a model for other organizations who are now continuing this outreach throughout the country. "Project Open Hand is one of the Bay Area’s best-known, most respected and beloved charities. For more than 24 years we’ve provided food, nourishment and emotional support to people facing life-threatening illnesses. In 1985, our founder, Ruth Brinker, a retired meal service manager, began preparing meals for seven people living with AIDS. The first grass roots response to the nutritional needs of people with AIDS in the nation, Project Open Hand today serves men, women and children with any acute, critical illness – HIV/AIDS, cancer, heart disease and many others, as well as a separate program for seniors ensuring companionship and nutrition for our community’s elderly. We rely on literally hundreds of volunteers, and on support from tens of thousands of people like you who believe in our mission to provide meals with love. Because of the Giants and our other corporate partners who have underwritten this event, every dollar pledged through Plate to Plate will go directly to Project Open Hand’s meal, grocery and nutrition counseling programs in San Francisco and Alameda counties." If you would like to donate toward my run, follow this link. No donation is too small. If you are unable to donate monetarily, consider donating your time to Project Open Hand or an organization near you. Congrats on picking such a fun event. You will do great and I can't wait to hear about it! Kudos to you for running that event. I'm a sad runner. I run only once a week -- on the treadmill. I hate every minute of it, but do it because I know it's good for me. I hold true runners like you in utmost admiration. Good luck on the event.